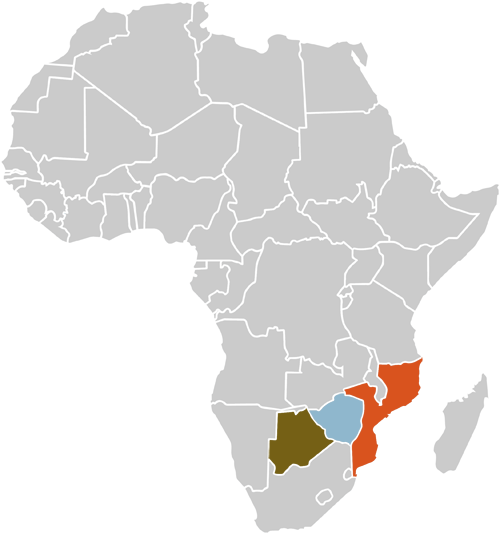 Mozambique is bordered by the Indian Ocean and four African countries. Arab and Chinese traders had established trading hubs along the coast for hundreds of years before the arrival of the Portuguese in the 1498. Portuguese colonization ended after the war of independence in 1974. Mozambique is now enjoying the fruits of democracy with a growing tourist industry. The continental culture of Mozambique makes it so different. The official language is Portuguese. The official language is Portuguese. After checking into the Liv Inn guest house and enjoying welcome refreshments. You will be taken on a city tour of Maputo. You will visit the Central Market Hall and the neighbouring open air market. The Iron house designed and built by Gustav Eiffel. The Feime Art Craft Market, where beautiful handicrafts are made. You will visit the Fortress a very popular site. Local artists display their art at the Nudeo de Arte. The Railway station built in 1916. All the sites are housed in beautiful colonial Portuguese buildings. Lunch at Mungo’s a great casual restaurant featuring Mozambique/Portuguese food. Dinner will at the Dhow overlooking Maputo Bay. Be there for cocktails as the sun sets. Water and cold drinks on tour included. City tour included. Lunch and Dinner not included. After an early breakfast we depart Maputo at 07:00 for Praia do Tofo (Tofo), it is approximately a seven and a half hour journey, we travel up Mozambique’s main highway the EN1. Passing through small towns like Xai Xai on the banks of the Limpopo river and see many examples of Portuguese colonial architecture, you will pass local woman selling cashew nuts, handicrafts, ice cold drinks and get a very good feel of Mozambique. Arriving at Tofo in the early afternoon and checking into your guest house Casa no Praia. After a swim in the warm waters of the Indian Ocean, enjoy the sunset and beverages on a Dhow (included) as it sails the waters between Inhambane and Tofo. Enjoy dinner at one of the many eateries in Tofo. Guest House accommodation included. Breakfast included. Water and cold drinks included, Lunch and Dinner not included. Tofo is regarded by many as Africa’s Ibiza, especially during South African varsity vacation’s. It is better known for the snorkeling and scuba diving. For an unknown reasons giant Manta Rays circlean area where they congregate making for spectacular underwater dives. Whale Shark are also seen in great numbers. They totally ignore you. (Yes I know what you are thinking. No. They are not known to attack divers.) Millions of tropical fish feed off the parasites on the Whale Sharks and Manta Rays providing incredible viewing. There are three diving company’s in Tofo who hire out diving equipment, offer instruction and take you out to the reef and are in attendance all the time. If you prefer, spend the day on some of the world’s finest beaches and explore the lagoon and surrounding area. Guest House accommodation and breakfast included, water and cold drinks on tour included. Lunch and Dinner not included, diving equipment not included, boat ride to reef not included. After breakfast at 08:00 we depart for Vilanculos about a four hour journey which along with nearby Bazaruto Archipelago is Africa’s most beautiful coastal area. In Vilanculos the prawns are reasonably priced the beer is as good if not better than any other the views of the coast, the beaches, the islands and the sea are mesmerising. After arriving in Vilanculos and checking into the highly recommended and beautifully managed Palmeiras Lodge, visit the beach, walk the town of Vilanculos or do what most people who visit do which is as little as possible. Enjoy lunch and dinner in town (for your own account) there is always a buzz there, it’s where high end tourists and backpackers enjoy the same facilities and hang out African style “no mutata” meaning with no worries. Guest House accommodation and breakfast included. After an early morning swim and breakfast we go island hopping on a Dhow till 15:00. Some of the islands are uninhabited and are indescribably beautiful. A Bar B Q lunch will be prepared and grilled on the island. You return and spend the rest of the day at leisure. Guest House and breakfast is included. Water and cold drinks on tour included. Island hopping and lunch are included. Your relaxing day. Enjoy a late breakfast, then head down to the beach and try water skiing, maybe kite surfing or just sitting on the beach doing very little other than realizing that you now know that you have experienced paradise. For lunch try a prego roll, typically Mozambique every steak roll you have from now on, will be compared to a prego. A wonderful tasty seafood dinner for which Mozambique is famous for, is included and will be a great ending to your stay in this beautiful country. Guest House Accommodation and breakfast included. Seafood Dinner included. After a last early morning swim and a late breakfast, you depart for the Vilanculos airport at 11:30. You will be flying down the beautiful Mozambique coast to Maputo International Airport for you international connection. Visit Mozambique it is what all the worlds tropical destinations looked like before the tourists and monstrous hotels arrived. Visa’s are required from some countries. Consult your Medical Professional about Malaria medication. You can hire all diving and water sport equipment. Instruction is free.